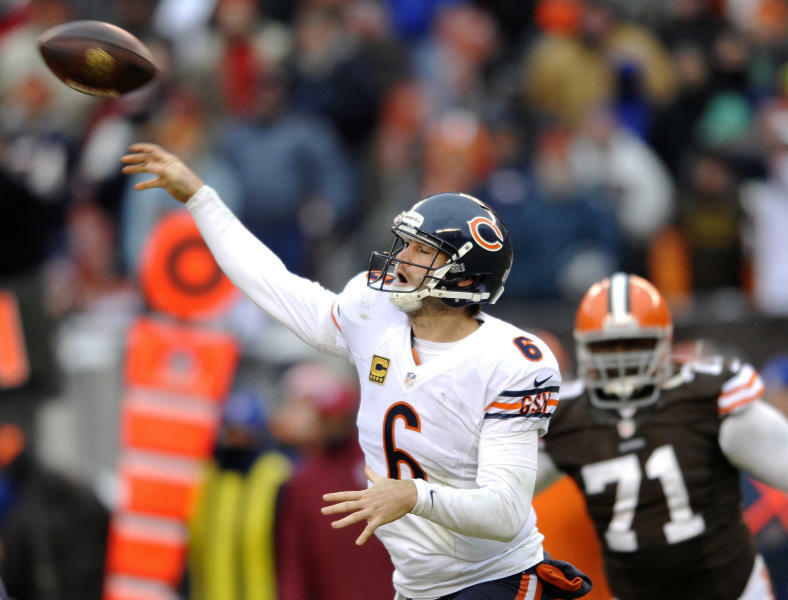 CLEVELAND (AP) — Jay Cutler felt the pressure and knew he had to perform well. There was no other option. This wasn't the time to buckle. Not with his teammates, his coach, and frankly, all of Chicago counting on him. Once the rust came off, Cutler came through. Shaking off two first-half interceptions, Cutler threw three touchdown passes in his first start since Nov. 10, leading the Bears to a 38-31 win on Sunday over the Cleveland Browns. Cutler, who missed Chicago's previous four games with a sprained left ankle and reclaimed his starting job from Josh McCown earlier this week, threw a 4-yard TD pass to Earl Bennett with 5:41 left as the Bears (8-6) rallied in the second half and stayed in contention for an NFC playoff spot. Cutler finished 22 of 31 for 265 yards and validated first-year coach Marc Trestman's decision to stick with him over McCown, who had played so well while filling in for Chicago's starter. Trestman's choice didn't come without controversy. There were reports of division within Chicago's locker room, but on a brutally cold and blustery day in Cleveland, the Bears were united. 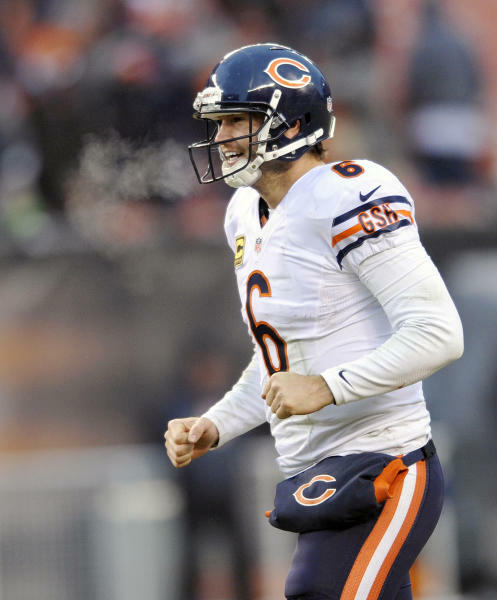 "The guys rallied around me," Cutler said. "I'd be lying if I didn't say there was (pressure) with everything on the outside and as well as Josh has played. But this was the plan all along and no one really flinched in our building." Michael Bush's 40-yard TD run with 2:17 left sealed it for the Bears, who completed a four-game sweep of the AFC North and won their first road game since Nov. 4, when McCown led them to a win over Green Bay. Trestman had promised Cutler would keep his job once he was healthy. And after Cutler was cleared earlier this week to practice, Trestman kept his word and started the not-always-popular veteran, a decision that had some Bears fans questioning whether it might be better to stick with the hot McCown, who has thrown 13 TD passes and just one interception this season. Trestman said there was no doubt the Bears believed in Cutler. "They played hard for him today and they had his back," Trestman said. "He's a captain — an elected captain — and I'm sure he would tell you that not just the offensive guys, but throughout our football team, they stuck together and won for each other today." Cutler looked shaky in the first half with the two picks, but he settled down and brought back the Bears, who fell behind 24-17 when Cleveland safety T.J. Ward returned a fumble 51 yards for a TD. Backed up at his own 5 in front of Cleveland's Dawg Pound section early in the fourth, Cutler drove the Bears 95 yards — with the help of two defensive penalties — and hit Alshon Jeffery with a 45-yard scoring pass to tie it with 10:59 left. Cutler lofted a deep pass toward the front of the end zone to Jeffery, who wasn't open but hauled in the throw when safety Tashuan Gipson badly mistimed his jump. Chicago's Brandon Marshall had six catches for 95 yards and a 5-yard touchdown. Marshall knew Cutler was playing with more at stake than usual, and could understand his teammate being nervous. "He's not going to show it, but the human side of things, you got a guy — Josh McCown — playing lights out, probably playing better than any quarterback in the National Football League," Marshall said. "That's what I love about Jay, man. Doesn't matter the situation, he's going to be the same guy. That's what I respect about him as a player, as a captain, but also as a friend." Chicago's Zackary Bowman returned an interception 43 yards for a TD to give the Bears a 17-10 lead in the third quarter. Gipson had one of two defensive touchdowns for the Browns (4-10). But as has been the case in recent weeks, Cleveland's defense couldn't get the big stop when it needed one. 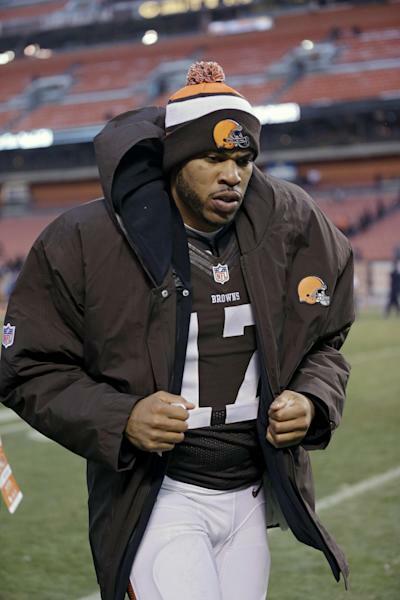 The Browns have lost five straight, eight of nine and dropped at least 10 games in six straight seasons. "It kinds of defines our season," said Browns quarterback Jason Campbell, who finished 23 of 39 for 273 yards and one touchdown. "There were some good things and some bad things. It's frustrating." Campbell's 43-yard TD pass to Josh Gordon brought Cleveland within 38-31 with 59 seconds left. The Browns, who lost a heartbreaker in New England last week when they couldn't recover a late onside kick, were then penalized for illegal formation trying one of their own and the Bears ran out the final seconds. NOTES: The Browns lost star CB Joe Haden in the second half with a hip pointer. His absence allowed Cutler to pick on rookie CB Leon McFadden. Chudzinski said the team will know more about Haden's injury Monday. ... Gordon finished with three catches for 67 yards. He was involved in a minor car accident Saturday. ... The Bears limited the Browns to 93 yards rushing. Chicago came in ranked last in the league, allowing 157 yards per game.